Radio frequency identification technology has made tracking marathon race results a much easier and more accurate operation, according to a Technology review article. Specifically, at the annual Rock ‘N’ Roll Seattle Marathon, all runners now are armed with a ChronoTrack D-tag containing an RFID chip made by RFID technology developer Impinj. 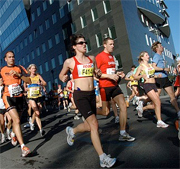 In the past, runners had to rely on human beings working the races to track what time each runner left and finished, however, the RFID tags make that operation unnecessary as now each runner has an exact readout of when they crossed each line. While the use of various chip-technologies to track when runners were crossing various areas of a race is not entirely new, previous attempts were abhorred by some runners as being too bulky or heavy to carry with them for the 26.2 mile trek. The major benefits being seen with the addition of the RFID tags is that they are both unnoticeably light and cheap to provide to the runners.